When you want a break from the busy city, what comes to your mind? Spending a day close to nature can make you refreshed and energized. Isn’t it? And thinking about an outdoor event, nothing can make you relaxed other than lying in a hammock tarp for sleeping or reading your favorite novel. Certainly, with the best hammock tarp, you can have the most enjoyable event. Are you searching for the best tarp for hammock camping, hiking or picnic? How do you know which one is best for you? Really, it’s not an easy job. Especially, when there are thousands of hammock tarps available in the market at different prices. But, not to worry at all! There are a few identifying things you need to look for when you are searching for the most durable, weather resistant hammock tarp. Here, we will review the 5 top rated hammock tarps in the market. Along with that, we will provide you with all the additional information regarding hammock tarps that will help you find the ideal one suitable for every season. What is a hammock tarp and why do you need it? 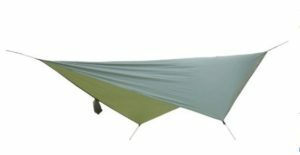 What are the types of hammock tarp? Most of the users and nonusers already have an idea what a hammock tarp is. However, to give you a clear understanding, we would still like to reiterate a hammock tarp is basically a waterproof fabric. It is used to cover hammock, shelter or tent to keep it safe from getting wet. Usually, such tarps come with straps which you can use to tie the hammock protecting your required place. Are you thinking why do you need it? Well, a hammock tarp can be used in many ways. It’s a very useful fabric that can be used in four different ways. When you are camping during winter, there is a high risk of temperature fall, snow or heavy wind. In that case, you can use a hammock tarp to protect your tent or shelter from getting wet. Similarly, you can use the tarp in the rainy season to keep your shelter, clothes or even kitchen from rainwater. Therefore, the hammock tarp is also called a rain fly. Apart from these, you can use the hammock tarp too for getting shade from extreme heat. If you will look for a place to change clothes, the tarp can give you privacy. On the other hand, when you are running out of space to sleep, you can use the tarp as an additional shelter. In the summer season, you can simply tie the hammock tarp with the tree branches and enjoy nature. Even during the night, you can sleep under the open sky counting the stars. The design is very flexible to transform a piece of fabric anyway you want to use. Moreover, they are very lightweight that will consume less space in your backpack. Overall, the hammock tarp is a useful element that can help you for a normal event, picnic for camping in wildest nature. Having a hammock tarp in your backpack will act like your friend in need when necessary. Now, we are going to review five of the top rated and best-selling hammock tarp that is trending at present. Each of the products belongs to the renowned brand and comes with an affordable price. We can surely say that buying any of the tarps you will not regret. These tarps are highly recommended by users and experts. Are you looking for the most comfortable tarp at the best price? Our first hammock tarp comes with all the qualities you need and certainly in an affordable price range. This tent tarp is from Chill Gorilla which is a leading brand in the production of the tarp. Now let’s explore its other features! As by the name, you can realize that you can use the tarp as a tent. No matter how you use, it will give you the utmost relaxation whenever you want. On top of that, you won’t have to worry about getting wet during winter or rainy season, because this product is made of waterproof material. Moreover, the ripstop nylon material ensures the durability you expect from a hammock tarp. Whether you want to tie it on the tree or make it a shelter, it will be able to support you any way you want. The material is also anti-rip; thus you don’t have to worry about getting tear or puncture in severe condition. Are you worried about its functionality? This tarp comes with nine tie downs, two centerlines and rain fly. This does not only ensure security but also it can deal with heavy wind or natural calamities. Also, it’s an extremely lightweight and compact size that you can pack in your backpack and carry easily. It’s one of the outstanding hammock tarps which come with versatility as you need. So, you can definitely purchase it if you need such tarp immediately! When the product is delivered, don’t forget to check if all the parts are shipped properly. Are you fond of thrill experience? Looking for a hammock tarp for camping? Do you need a durable and easy to set up the tarp that will save your time and energy? Then definitely this tarp is designed for you. The Ultimate Survival Technologies design and manufacture tarp that has all these qualities. Let’s find out what features it offers. One of the most significant features of this tarp is it’s easy to use. You can use the tarp as a tent or just the tarp. To do that, the tarp comes with guy lines, steel stakes, and instruction manual. Once you read the manual, you will get the complete guide to use the tarp as a sleeping tent, protective gear, ground sheet or as thermal protection. All these facilities are possible with just one tarp. Amazing isn’t it? Even though you can use the tarp in many different ways, it doesn’t weigh much. As a camper, you definitely don’t want to carry extra weight to hurt your shoulder. Thus, the tarp is not only strong and durable but also ultra-lightweight. You won’t have any trouble to carry it in your backpack. It’s also a one-time investment because you can use the tarp in any season. From extreme summer heat to heavy wind or rainfall or temperature fall, this tube tarp from Ultimate Survival Technologies will give you the shelter to protection any time you want. So, what are you waiting for? Go grab it before the tarp is stock out! Most of the users use a hammock tarp as rainfly. If you are looking for a tarp for this purpose, here you present to you the most effective rainfly from Hennessy Hammock. It’s made of durable material thus can give you the support you need during camping or hiking. This tarp is popular to give you protection any type of calamities. Not only from rain but also from an animal attack, the hammock tarp is designed and manufactured with water resistant and anti-rip material. So, whether you want to use it for protection or sleeping space, it can support you rightfully. Even though the tarp belongs to the expensive category, comparing to the quality and versatility, it’s definitely worth it. If you are running out of space, you can use the tarp as a sleeping tent as well. Moreover, you can easily set up the tarp. All you need to do is tie up the lines in the proper direction, it will get in shape. Nevertheless, the tarp is made of PI coated polyester material. It can survive heavy wind or snowfall. However, it doesn’t weigh much for you to easily carry. So, while you are on your campsite, you may need protection for your kitchen or tent roof; or you need a ground sheet to keep you dry from water or snow, you can have this one tarp for all these purposes. It’s one of the amazing quality hammock tarps you don’t want to miss. Similar to all other great quality hammock tarp, the renowned brand Wise Owl has designed this tarp with all the advanced features. Besides the quality of weather resistance and lightweight, this tarp has more to offer. Let’s explore them now! 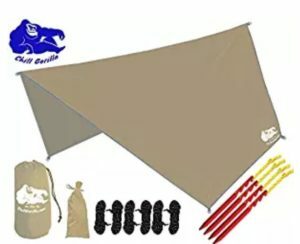 The tarp comes in a set that includes everything you need to set up. Even though you can use the tarp in all season, the tarp is specially designed to get protection from heavy rain. So, even if it rains for hours, use the tarp as a tent roof or ground sheet, you can remain dry. Besides, as the tarp is extremely light, you also won’t have any worries to carry in your backpack. Regarding the usage of the tarp, you can use it as rainfly or get protection from the sun. it will become your shield from natural calamities. But, if a tarp deals with heavy wind or rain, there is a chance of getting tear or puncture in the tarp. 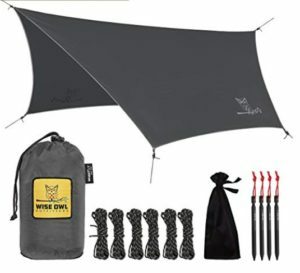 However, the Wise Owl tarp is made of Ripstop nylon which ensures strength and durability. So, you won’t have to worry about puncture or tears. So, it’s another versatile tarp that comes with all the features and facilities you require during camping. When you are deciding which tarp you are going to purchase, you can keep this tarp in your consideration. If you are looking for an extremely durable hammock tarp and still haven’t got one, here is the right option for you. This pro force all weather shelter tarp from Sungpak is made of durable material as you need. Let’s find out its functionality and other features. Besides the material, the tarp is designed to deal with wild nature and animal attack. So, no matter how dangerous the place you choose for camping, this tarp can provide you the protection when you are in deep sleep. Also, during the daytime, you can get the shield from heavy snow, rainfall, UV rays, and wind. On the other hand, the tarp is also a versatile one. Along with the weather resistant feature, the tarp can be used as a tent or protection over tent roof or additional shelter. Overall, you can use it for protection to privacy shield; anyway, it can serve you as you need. So, if you are a frequent traveler or hiker and need a tarp for regular use, you can have this Snugpak Pro Force All Weather Shelter. 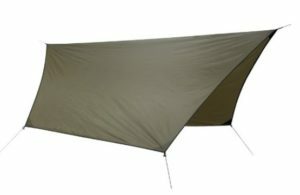 The tarp also comes in a light olive color that can hardly be visible when you are camping in the forest. Overall, it’s a great tarp for casual use that comes at a great price. It’s great for those who want to move fast and travel at the light. All in all, it’s a perfect complement to any outdoor pack and will provide the user with versatile protection from all weather conditions. Moreover, it’s designed to allow us to use it in a variety of tradition tarp configurations as more free-standing style alongside some help from additional equipment like paddles, walking poles, etc. Also, it can be set up in virtually any environment, without a tree no less. Can be used as a tent, rainfly, shelter etc. Even though the functionality of hammock tarps is more or less similar to each other, there are various types available. Each shape has its own versatility. Depending on the shape, functionality, weight, and price vary. Below are some of the most common types of hammock tarps are commonly used. The rectangular is the most common shape that we usually see. It’s used to cover a large space. And comparatively other shapes, the rectangular tarps are big in size and heavy to carry. Since the rectangular tarps are heavy and big, a comparatively smaller size has been introduced is the square tarp. These tarps are more convenient to carry, less heavy and easily foldable in a backpack. The hexagon tarps are highly demanded by the campers. The tarp has six sides tying which you can make a rainfly. It helps the water to fall off easily from the roof. 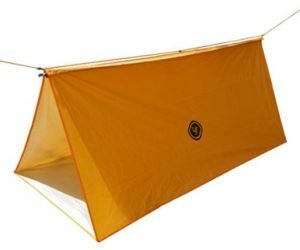 Since the hexagon shape is very lightweight, easily portable and resistant to any weather make the tarp popular among the campers, hikers, and trekkers. The diamond shape tarp is similar to rectangular tarps. Additionally, it comes with a ridgeline diagonally. Moreover, you can easily set up this lightweight tarp in your desired shape. And you don’t need to worry about carrying heavy weight. The four season hammock tarps are designed to support in summer, spring, fall, and winter. If you are looking for a tarp to use throughout the year, you can have this four-season tarp. It will give you the support you need, easy to carry and available in affordable price. They are also easy to set up. Actually, the ways to set up the hammock tarps depend mostly on the user’s decision. However, depending on the different types, the functionality might vary. Here are a few ways that are commonly used and considered beneficial during camping and other outdoor activities. In order to keep yourself and your shelter or kitchen dry, the hammock is used as a roof. Therefore, the tarps are tied in a way that looks like a sloped roof. To do this, you need to set up the tarp about one meter above the required place. Then, tie the straps strong and give it a symmetrical shape. This way, the water will slide down when it rains or snow falls. On the other hand, if you want to set up a triangular tarp to combat the heavy wind, set up the tarp in a diamond shape. All you need to do is, tie the four corners in a clockwise pattern. For example, the 1 and 3 straps will be fixed on the hammock and on the other hand the 2 and 4 straps will be tied on the ground. If you are intending to use the hammock tarp as a shelter, you can still tie the strap in the traditional way. Just that you need to tie two angles on the ground and other two should be tied with a stick or tree branch at the height of the line. Remember, this way is recommended during summer days to relax close to nature. It will not be enough effective to deal with heavy rain or wind. What do you think, tent set up is easier then tarps? You may also watch the video to set up the hammock tarp. Since you already know how to set up a hammock tarp and its usefulness, now we would like to share some tips. A tarp is not only for shelter from rain or winter. You can do much more things with a hammock tarp. Therefore, below are some of the tips that can help you get some additional advantage during your outdoor activities and events. Imagine, you have set up the tarp to get shelter from the rain. But, if you want some light or splash of sun rays, set up the tarp as A-frame. You can leave the front open to get some fresh air or enjoy nature’s view. On the other hand, if you are not happy with the tarp height, but the straps are not enough long. In that case, to set up the tarp at a higher position, you can use the folding tent poles with the tarp straps. No matter what you buy, having a guideline in hand helps to take the right decision. 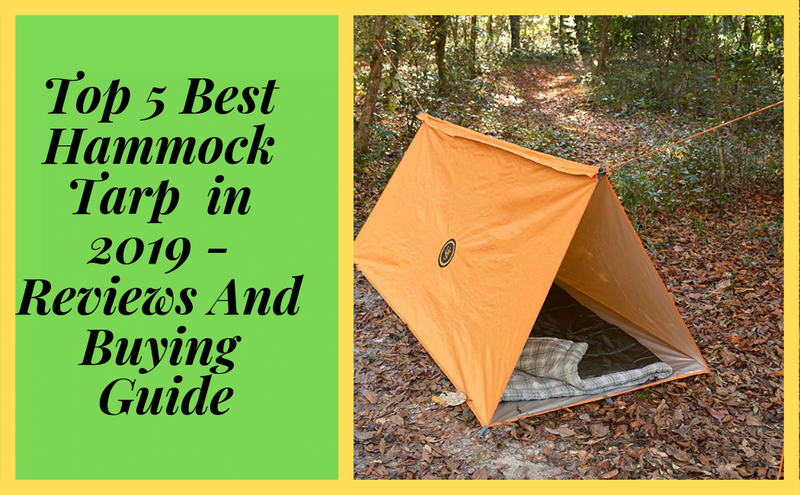 Therefore, we have included some of the must-have features in this article so that you can find your ultimate hammock tarp. Considering these features you will not only identify the best quality tarp but also invest your money only on the product you need. So, let’s have a look at what you should be searching for in the best hammock tarp for you. Before deciding on a hammock tarp, always do some brainstorming. It will help you to choose which type of tarp you will need. Therefore, always ask yourself what is the purpose of buying a tarp. How are you going to use it? When are you going to use it? Like this, you can add some more questions and it will help you to set the budget. As you already know, there are many shapes available of hammock tarp. Each shape is suitable for different purposes. So, depending on your need you can choose the one that is right for you. For instance, if you are looking for a tarp to use it throughout the year, then the 4 season tarp might be great. On the other hand, if you are looking for a hassle-free and easy setup tarp, then the diamond shape will be suitable. To take the right decision, go through the types of tarp we have mentioned in the above section. People use a hammock tarp for protection. Either for protecting a shelter or kitchen, checking the weather resistance quality of a tarp is a must. If you are looking for a tarp to deal with heavy wind or rainwater, then the four season tarp will be great. You can use the tarp as a roof or rainfly. So, remember to check the weather resistance quality in your targeted tarp. A hammock tarp must come with two guy lines. If you need more, there are tarps with more than two guy lines. These lines help you to set the tarp downward and give you the required shape. Without the guy lines, you will have a hard time setting up the tarp properly. So, keep this in mind to check how many guy lines are there. Besides the guy lines, you should also pay attention to the ridgelines. If you are looking for a budget-friendly tarp, then the full-length ridgelines will give you the support you need during bad weather. Since a hammock tarp will give you protection, the material must be strong and durable enough to combat bad weather. Usually, the hammocks are made of tree fibers. But, you will also find cotton made hammock tarps. They are highly popular for their breathability and lightweight. Nevertheless, there are tarps made of polyester and nylon. Even though they are synthetic, still they make the tarps strong and durable. They will give you the right support during rainy days, winter nights or summer heat. If you are looking for less expensive tarps, you can go for nylon or polyester material. Hammock tarp is one of the essential accessories that you need for outdoor activities. If it’s too heavy, then your trip will be more hectic and tiresome. Therefore, always consider checking the weight of the hammock tarp. Most of the branded and outstanding quality tarps are lightweight yet durable. And mostly they weigh no more than 2 to 3 pounds. If the weight is more, it will be difficult for you to carry. Keep this factor in mind. The durability of your hammock tarp mostly depends on the material. If the material is cheap on and not resistant to worse weather condition, then it will not last for long. So, when you are looking for a tarp, look for quality like anti-rip, weather resistance etc. Moreover, if the tarps are easy to clean, then also you will be able to use the tarp for years. Not considering the must-have features before purchasing a tarp can be a grave mistake. there are various types of tarps available and used for different purposes. If you don’t consider the must-have features, you may randomly purchase a tarp which is not really hammock tarp. Besides, you may think that getting the best tarp in the market would serve you the best. But, a product from the best brand may not necessarily be the type you need. Hence, you may invest your money in a wrong hammock tarp. Nevertheless, you may look for budget-friendly tarp since you are going to use it for an event or two. Thus, you are ready to compromise the quality over price. But, if it doesn’t have the features like weather resistance or guy line, how are you going to use it for protecting purpose. Likewise, there are endless risks that are waiting for you if you don’t consider the significant features. Therefore, it’s always wise to qualify a product with these features because we don’t want to waste our hard earned money on a product we don’t need. Now we go for the final word but before that here is a short video for you about the best tarp for hammock camping. We are at the end of our Best hammock tarp reviews. Each of the tarps we have presented not only belongs to renowned brands but also achieved great satisfaction from its users. To help you to take the right decision, we have honestly addressed the strengths and shortcomings of each hammock tarps. You can pick any of the tarps and you won’t regret. Before you purchase, don’t forget to pay attention to the must-have features we have mentioned in the article. Hope you have found your targeted tarp for your next camping!